Amy’s been using #OpenAPS (closed loop artificial pancreas system) since March and it’s been working very well, with some impressive results such as waking up in range without fail and without intervention every morning. Her set up includes a Dexcom G5, her phone (Xiaomi 4X), her OpenAPS rig (Edison/Explorer) and a 10 year old Medtronic 715 insulin pump. The only real issue we’ve had is bluetooth connectivity which we’ve resolved very well. So, OpenAPS is excellent and gives great results, but Amy’s pump is six years out of warranty already, might possibly break at any moment (unlikely) and the backup pump (Medtronic 712) is even older than the primary one. The dwindling supply of loopable old Medtronic pumps makes me nervous so for a while now we’ve been looking at alternatives. Say hello to the Dana RS. 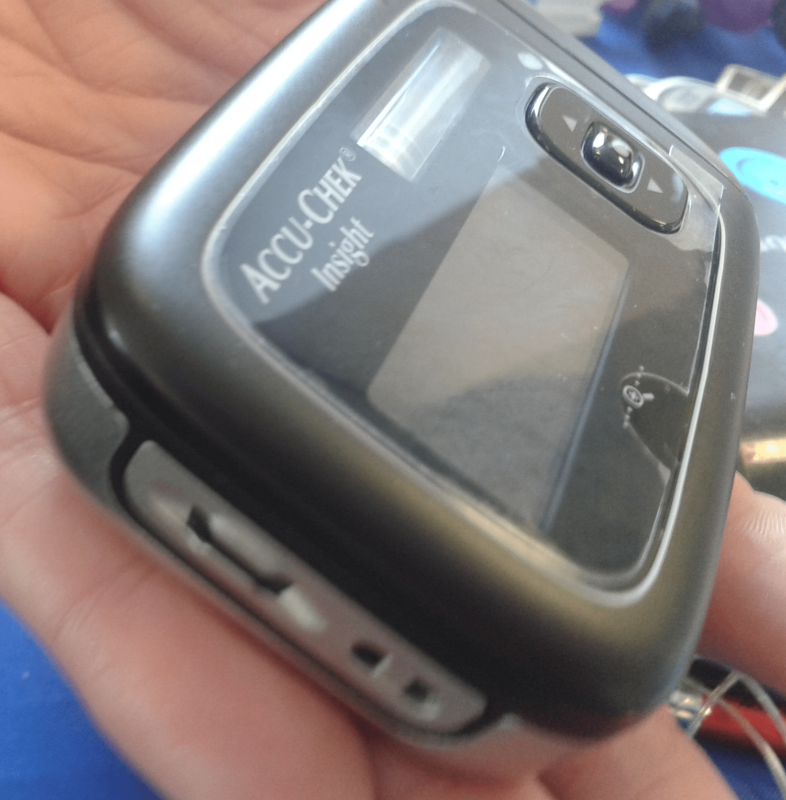 A brand new insulin pump which can be used with AndroidAPS – which is based on OpenAPS code – and most importantly retains its warranty even if being used for DIY closed looping. AndroidAPS runs on an Android phone and communicates directly with the CGM source (Dexcom G5 in Amy’s case) and the Dana RS pump, no other hardware is required and most importantly there’s nothing which needs charging or could be forgotten when leaving the house each time. The potential to control the Dana RS using an official phone app from an Android phone (or iPhone if you really must 😀 ) is a great step forward, although its unlikely she’ll use this when she’s wearing CGM as AndroidAPS will be controlling everything. 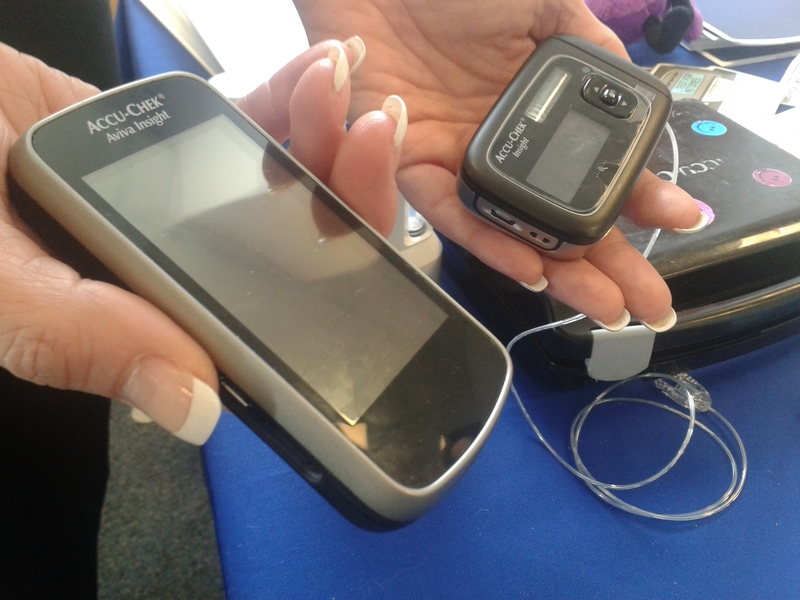 It is the only pump to allow full control via a phone: setting TBRs, doing a bolus, altering settings. It’s taken a while to get here: I first mentioned about the Dana pump at clinic in September 2017 – back then we were talking about it’s predecessor the Dana R. I won’t go into detail but it’s been a slow process of discussions with Amy’s team to get to a point where they are happy for Amy to trial the Dana RS pump with a view to it becoming her new pump. It’s not a pump they knew about so I can fully understand any concerns they have but (I hope) they came to realise that we knew a lot about it and were confident it was the right pump for Amy at this point in time. Back on the 12th July Amy got to see the Dana RS for the first time, she was excited. Tom, the Dana rep from Advanced Therapeutics, demoed the array of holders, pouches and holsters which pleased the girl who’s missed the trusty clip of her Animas Vibe pump. She was most excited by the 360 degree cannula which spins, hopefully meaning less kinked tubes and less pain during the inevitable moments when tubing meets door handle. Yesterday Tom came to our home to train Amy in everything, with us parents taking a real back seat, and within an hour or so she was up and running. Day 2 has started, she’s alive, we’ll call that a win. The trial lasts one month so we’ll keep you updated. We have no plans to involve AndroidAPS in the month’s trial but I’m not sure whether we’ll stick to that. To see more about what you get in the kit and find out more about the Dana RS take a look at Andy’s Dana RS kit blog. I love you because you care about people. I love you because you want to help people. I love you because you recognise the fortunate position we are in. I love you because you know we don’t go without the things we need, like insulin for our youngest daughter. I love you because you have compassion for people who need the things we get easily or for free, like insulin for our youngest daughter. I love you because seeing or hearing about a family who can’t afford the insulin their child needs would bring a tear to your eye. I love you because I know you’ll understand that I’m donating any money I would have spent on some roses for you to the Spare A Rose campaign. But mostly I love you because this act has made you happier than receiving any flowers. But don’t worry I’ll still get you some chocolate. Lack of access to insulin is the most common cause of death for children with diabetes in many countries around the world. In fact, in some parts of the world, the estimated life expectancy of a child who has just developed diabetes could be less than a year. This Valentine’s Day our community can continue to help change that. Through the Spare a Rose, Save a Child campaign, we raise awareness and donations for Life for a Child, an International Diabetes Federation program which provides life-saving diabetes supplies, medication, and education that children in developing countries need to stay alive. Spare a Rose, Save a Child is simple: buy one less rose this Valentine’s Day and donate the value of that flower to children with diabetes. Your loved one at home still gets flowers and you both show some love to children around the world who need it. You can donate here: https://lfacinternational.org/sparearose/. Wednesday’s topic:May is Mental Health Month so now seems like a great time to explore the emotional side of living with, or caring for someone with, diabetes. What things can make dealing with diabetes an emotional issue for you and / or your loved one, and how do you cope? I’m not so sure it gets me down but it’s incredibly hard seeing your child get upset, about anything, ever. Throw in Type 1 Diabetes into the mix along with teenage years, blood-glucose-level-challenging-growth-supports and the fast-forming schoolgirl cliques and it’s amazing that the dark days don’t occur more frequently. There’s no doubt that I find it difficult when occasionally it all becomes too much for Amy, those days when she’d rather just be someone with a fully functioning pancreas, those days when she doesn’t want to be different. I know she’s had too much when I just get ‘the look’ usually after I’ve asked her to try and fill out more details in her log book, which I use to check whether or not there’s a pattern and therefore her insulin pump’s basal needs adjusting. Just after I’ve got ‘the look’ I absolutely hate diabetes and wish it would bugger off for good. I normally don’t mention anything about diabetes for a good while afterwards. But this isn’t what really gets me down about diabetes. I find the attitudes of some others without diabetes annoys me too: those that “can’t cope” with their slightly runny nose; can’t go to work or school because they’ve got a bit of a cough; find the bad in anything that happens rather than the good. Come on people, take a look around you and see what my daughter and many of my friends have to go through each day. Walk a the day in their shoes then realise that they cope with far, far more than you and they go about it with a smile. No, what gets me down is when I’m reminded just how brittle life can be for those with Type 1 Diabetes and the recent tragic story of the death of 15 year old Nicole Wilson brings this to the forefront of my mind. I heard about it through the news of #SingForNicole going viral and I must applaud Liam Payne for his tweet about Nicole, that’s a nice touch. I’ve known about ‘dead-in-bed syndrome‘ for a while now but some reason I’d always associated it with hypos following a night out drinking, so when a 15 year old died I was shocked. It’s the sudden realisation that all I thought I knew was wrong and my child could be taken from me at any time. Honestly I don’t think I’ve slept soundly this last week. 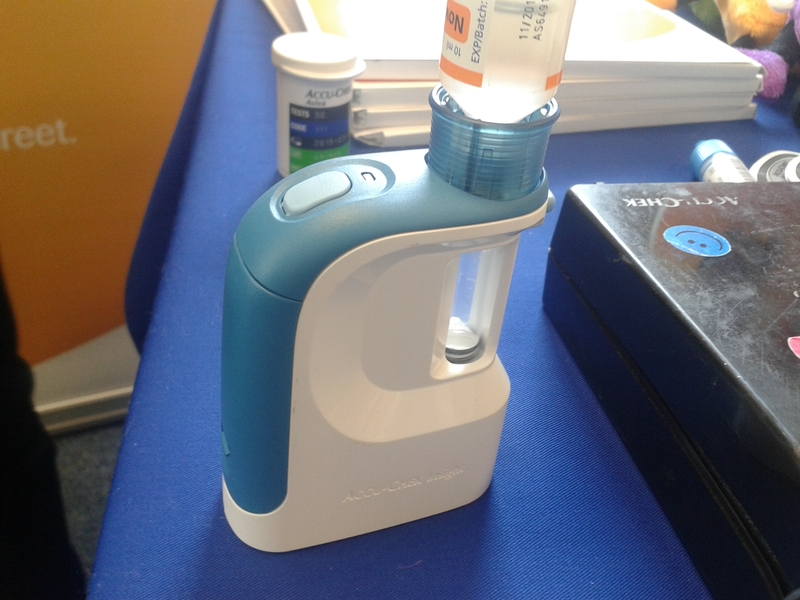 At a recent diabetes education day I got the chance to have a look at the new Roche Accu-chek Aviva Insight Pump, nicely demoed by Helen our local Roche rep. I was very interested to see this pump especially as it came a very close second to the Animas Vibe we selected for Amy last June. 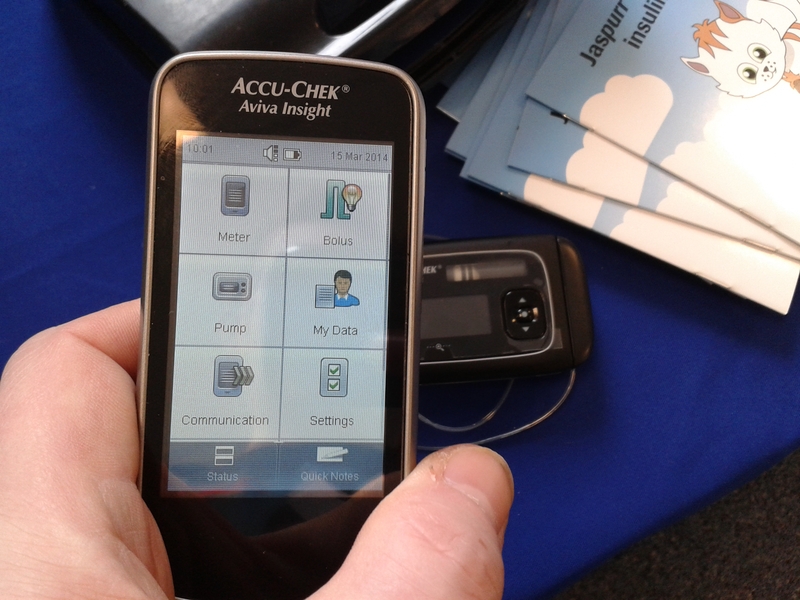 You may be interested in my write-up from our official demo of the Roche Accu-chek Combo Pump from May 2013. I only had a few minutes to look/play with the pump and its meter so I’ll keep this brief. 1. It’s still not officially waterproof although like its predecessor it’s IPx8 rated, as is same as the Animas Vibe which is regarded as waterproof by Animas. So it’s waterproof BUT if it gets damaged by water it’s not covered under warranty. This is (still) madness and something Roche need to sort out…in my opinion. 2. It has a new meter which has a more modern feel about it. 3. The pump appears to be much smaller and like its meter looks more modern than its predecessor. 4. The reservoir only holds 200 units of insulin. I was asked by a friend if this would be a problem for us and it wouldn’t: Amy changes her infusion set on her Animas every 3 days and puts about 160 units in. 5. There’s a new device to help fill the pump reservoir which takes some of the hassle out of the process. I liked this, a lot, which is why I took a little video…see below. 6. Soon after release you will be able to get pre-filled Novorapid cartridges, which appear to only hold 160u. 7. Both the meter and the pump look so much nicer than before. 8. If you want CGM, you’ll probably have to wait for the next pump model. 9. It is due for official release to the public in June/July. We arrived back from the hospital with pretty good glucose levels. It was about the same time Amy’s friends were leaving school. She texted them “I’m home, come over and see my pump”. 10 minutes later several friends turned up and they stayed outside talking in the garden. 20 minutes after that and Amy’s gone hypo (2.6mmol) as they’ve been bouncing on the trampoline, a lot. I remembered the conversation from earlier about testing out the temporary basal rate; what an ideal time that would have been, if only we’d thought about it. Amy had already done her first extra bolus at hospital for 3 chocolates, it had gone well. This was a big thing for Amy as she has missed out having snacks/treats for 2.5 years. She’s always had the choice to have snacks when others are but if they’re more than 15g carbs then she should give some insulin for it. She hates injections with a passion and virtually always chose not to, thereby missing out on snacks. Only now have I realised how much stuff we’ve stopped doing because of this, such as going to the cinema and having a snack during the film. So looking forward to these things now. Anyway, yesterday afternoon Amy wanted a snack and chose one of the iced buns we’d bought that day. Its 23g carbs would have needed a bolus so on MDI she wouldn’t have had it. Now though, there was nothing stopping her so she tested, bolused and ate. It actually took longer to eat the thing than prepare to eat it. That’s a big bonus. No, don’t panic, we didn’t hit the fast food restaurants last night, but we did have fast food…let me explain. The normal meal time routine involves calling Amy 10 minutes before dinner is ready; getting her to do a BG test; calculating her carbs (with her) whilst serving up the food; eldest daughter goes and eats; we stay behind to do Amy’s injection; Amy finally gets to eat. We’ve kind of got used to food starting to go cold, it almost seems normal. Last night’s meal was different in that Amy carb counted and immediately bolused, in seconds. The ritual of preparing the injection site, preparing the needle, hovering the needle over the site for what seems an eternity, doing the injection…these have gone, disappeared, hopefully forever. Eating hot food just might catch on again. We’ve got to test Amy’s blood glucose levels every two hours for the next 48 hours at least. This is something everyone going on a pump seems to do, although for many they have to do it for a week. I’d call that pretty darn good. What a long day it’s been, but a great one and one which has left us all still smiling. Dr Sheldon Cooper (Amy’s new pump name), or Sheldon for short, or Shelly when he’s feeling a little sorry for himself. If you don’t know who he is then do a quick Google, he’s a character from the Big Bang Theory, one of Amy’s favourite shows. If you know who he is then all I can say is Bazinga. Dr Sheldon Cooper says he’s one of the smartest people alive…and he probably is. He’s much smarter than those around him. He makes many calculations each day and in his own words he’s never wrong. His soul mate is Amy (Dr Amy Farrah Fowler). On many levels this pump was always going to be called Sheldon. Amy awoke excited at what the day would bring. She didn’t know which top to wear. I suggested ‘what about this?’ as I pulled her new pink DiabeTees iPump t-shirt out of my wardrobe. I’d been keeping it there for the past couple of weeks, trying not to accidentally tell her I’d bought it. She put the t-shirt on. Delighted would be an understatement. In the room today was Emma our Animas pump rep, our Consultant Endocrinologist, the DSN (DSN1) who would be supporting the pump transistion, another DSN (DSN2) who’s never used an Animas Vibe and the three of us (Amy, Jane and myself). The room was pretty full. Emma handed over the massive box to Amy who within seconds had got the pump out, battery in and raring to go. Such a large box of stuff, but importantly containing 20 sought-after pink cannulas, to match her pink insulin pump and pink t-shirt. Each of us was given a pump and we all went through the menus, primarily for the Dr and two DSNs who had not used this pump before. We are the first people in paediatrics at Winchester to get an Animas Vibe, I think though we maybe be the first of many. Amy and I already felt quite comfortable with this because of all the training we’d already had with Annie and later with Emma. Amy hates needles so I had no doubt that I (or Jane) would be filling the reservoirs for the first few months. Before we left this morning I asked Amy whether she was going to go into the session nervously or with confidence. We hadn’t discussed it much but clearly she’d chosen ‘confidence’ as she took the filling kit and insulin vial. Slowly she filled the reservoir with insulin, cleared any air bubbles, primed the pump and filled the tube. Emma talked us through using the infusion set installation, something the three of us were comfortable with as we’ve all worn one for three days previously. I was surprised that the HCPs showed no real interest as I guessed they’d not used them before. Amy installed her set with confidence, it had gone in perfectly, but disaster struck as she immediately felt faint. Under advisement from the Doctor she put her head between her knees and within 5 minutes was feeling much better again. Here’s Amy in showing off her pink Inset II infusion set. The conversation turned to the Doctor and two DSNs as Emma asked them what settings to apply on the pump for basal, and maximum bolus settings and the like. Once they decided, Amy set the pump up under direction from Emma and a close eye from me. I feel confident in setting up basals in the future, although don’t plan to do any changes by ourselves for some time yet. Amy clipped in her infusion set to her cannula, primed the cannula with 0.3 units of Novorapid and that was it: she was live on an insulin pump. It was time for a well earned break, it was lunchtime. We decided to go the cafeteria, get some food and bring it back to the training room. 30 minutes later, back in the room and Amy did a blood glucose test, chose ezCarb from the menu, entered her BG reading (4 mmol), entered the carbs (50g), clicked ‘Show Result’ and instructed the pump to give the bolus insulin (3u). After a bit more chat about temporary basal rates, sick days and school it was almost time to go, but not before we opened one of the two boxes of chocolates we’d bought for Emma and the HCPs, to say thank you. The box said it was 23g for three chocolates, Amy had done a test, entered the carb amount and given herself a bolus within seconds. This is one of the reasons she/we wanted the pump and as for the last 2.5 years Amy refused to have any snack over 10g/15g as she did not want to increase her daily number of injections. In three hours time we’ll be starting Amy’s appointment for fitting the pump. We’re all excited, Amy especially, she’s been counting down the injections one by one, there’s only one left which she’ll take at breakfast time. Luckily we remembered to only take half the Levemir last night. I’m normally prepared for days like this, normally writing down lists of questions I need or want answers to. When Amy and I went to the “Portsmouth Hospitals’ Diabetes “Sweet Meet” we’d written loads of questions – we were the only ones who’d done that I think – but we never asked any of them. The day had just flowed nicely and the preparation we’d done wasn’t required. So today we’re going to wing it: I’ve not prepared any questions and I can tell you that I’m shocked I haven’t. Surely today is more important than anything else we’ve done recently? Surely today we need to leave the hospital in total confidence? There’s no doubt that I’ve done a lot of research about the pumps and whilst I’m sure I know relatively little compared to people who’ve used a pump for a while, I am sure that I know more about the features of this pump than the hospital does. It’s to be expected, Amy will be the first paediatric Animas Vibe wearer, so the DSNs have never needed to know anything about it. Today then we’ll all be learning together: we’ll be learning about how to program the basal rates; the DSNs will be learning about the pump. I hope today will prove what a good team we’ll be together. I have not doubt it will. I’m a little worried that I’m feeling over-confident about today. Lord knows I’m nervous but it’s just because it’s a major change for my daughter, if it was for me I wouldn’t be so worried. My confidence boils down to a few things: I’ve done a lot of research, we’re not going into this blind; the #DOC has lots of Animas Vibe wearers who I know will be on-hand almost 24/7; I have phone numbers of parents whose kids are pumping with Animas. It’s good that the appointment is today as we’re but at the hospital tomorrow for Amy’s quarterly clinic so we can report back, face-to-face, any issues we’ve had before the weekend starts. I’ve referred to this journey towards a pump as a ladder, once which had rungs but just how many we didn’t know. This process could have been a little easier for us if we’d known at any point how many steps away from the pump we were. Just a thought for you. Today, sat at work, just recovering from my 12 mile cycle to work I got a call from a number I didn’t recognise. I didn’t answer it immediately but then saw it was a Winchester number, who could it be, I’d better answer it. It was a DSN whom I’ve never met whose recently joined the diabetes team and it was the first time I’d spoken to her, but what a first conversation to have, which lasted for the next 24 minutes. I hadn’t seen the email, it had been caught up by my email spam filter which had decided to ditch everything I did want and nothing I didn’t. Is the 20th July any good? I wasn’t near a computer to read the email so the DSN went over the details: would dates for the 20th and 26th July be okay? “Yes, of course, fantastic, wow, this is great”. “But I just want to check when Amy is going on the school trip in July first”. We spoke around different issues for a while, discussing how very confident we feel about going on the pump – yes, yes, we know it’s not a cure, yes, yes, we know that Amy might not enjoy the experience – and we spoke about initial use of saline or insulin. The DSN said she’d like to meet us before the first date, “how about a week and a half before the pump, perhaps on the 10th”. “No, the 10th is a Monday”. Hold on, you mean June? Many people seem to use Saline for a week or two, just to get used to wearing the pump: we discussed the issues over what would be best. Initially we both thought Saline would be best but…Amy’s off on a school trip to Europe mid July. So we decided going on insulin immediately was the best idea, to give us 3 weeks to iron out any issues. So there we have it, Amy will be getting her pump on 20th June, going on insulin straight away. One week later we’ll go back to clinic to check everything’s okay and learn all the advanced techniques. I think we’ll find it hard not to use combo-bolusing immediately! Two weeks later Amy goes on a school trip to Germany. Actually, I’m now blooming nervous. I wasn’t before but I am now. Today the latest JDRF T1 Kids magazine hit the doorsteps of houses around the UK, being delivered to thousands of children who have type 1 diabetes. I’m immensely proud that Amy has a two page article within it and even more proud that a picture I took of her fills the front cover. I’d like to thank JDRF for many, many things but especially today for printing Amy’s article. Special thanks go to Kate from JDRF, who has been so helpful organising this from their end, encouraging us, giving us ideas and creating the final article from a mass of words sent to her. Thank you Kate for giving me permission to reproduce the article on my blog. 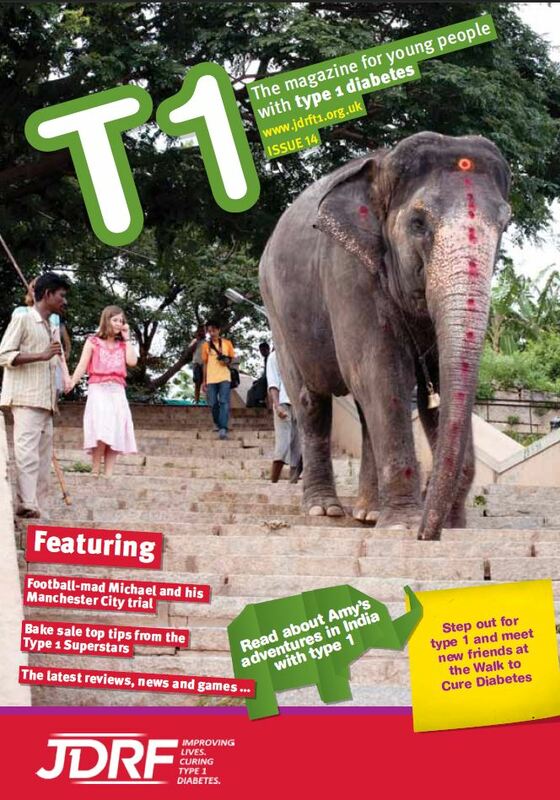 We’ve been subscribed to JDRF’s T1Kids magazine for a while now and have read the articles with interest. In early January, whilst thinking about how to motivate Amy as part of my New Year’s resolution I came across a request for articles for the magazine. Well, let’s think…hmmm….my newly diagnosed 10 year old backpacked around India, had a great time and survived. Yeah, that’s an article. 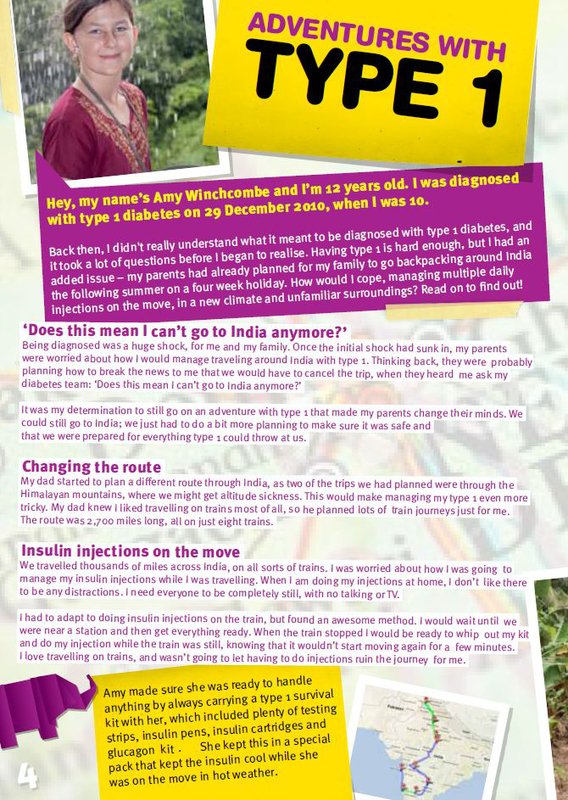 Actually though I first suggested that JDRF read Amy’s auto-biographical blog article on her diagnosis and only mentioned India as ‘maybe you’d be interested…’. I pinged off an email to JDRF which got to Kris – whom I’ve only just realised is someone I’ve followed on Twitter for ages. He passed it straight to Kate who’s in charge (I think) of producing the T1Kids magazine. She was very interested in the idea of an article about India as they’ve not had many/any like that before. First I needed Amy to do the full article for our blog as this was to be the final one in a 14 part series about our trip to India and dealing with type 1. It took a long time to get round to this due to other commitments. 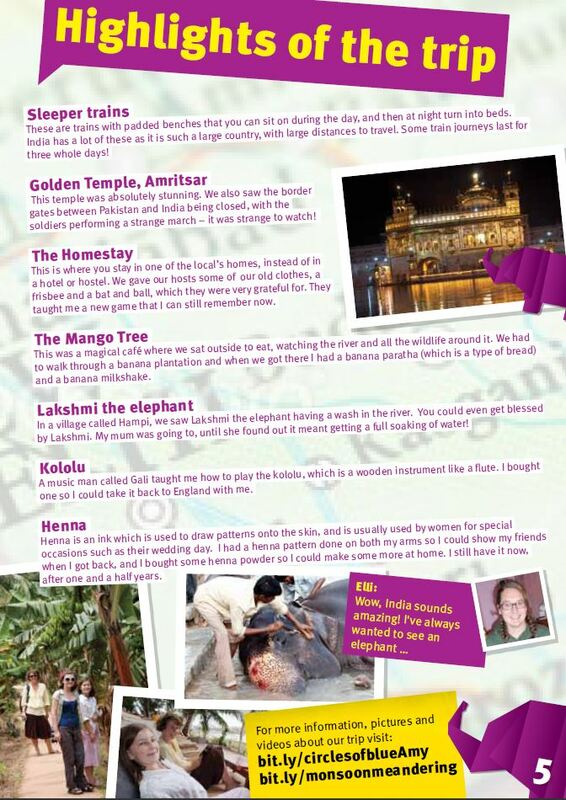 Here’s a link to the series of articles: Travel in India with diabetes and Amy’s India blog article. The article was sent to Kate, who then reworked it to fit the magazine style. Amy had written so much that it gave Kate a hard time trying to figure out what to cut. A few proof checks here and there and on 24th April we received the pre-print version in all it’s glory. I was amazed how good it looked, all typeset with the paper elephants everywhere. This is a shining example of how opportunities to break out of the box come from having something like diabetes. Don’t get me wrong, I’d prefer that Amy never wrote this article because I’d prefer that she didn’t have diabetes, but she does so let’s just get on with it and seize opportunities like this when they occur. Well done Amy for seizing this opportunity. So proud. Do you want to get hold of the magazine? If you just want to read the article you’ll find it below, but perhaps you want to subscribe to the magazine for you or your child to read. The main article is split across two facing pages but I’ve split it so you have a chance to read it. If you can’t quite read the images on this page either click them to open them up in full within your browser, or better still just use CTRL and + to – to zoom your browser in and out (works with Firefox, Chrome and Internet Explorer). In some browsers you can hold CTRL down whilst scrolling your mouse’s scroll wheel. This is post 9 in the series about that trip and its planning and how type 1 diabetes played a part. This post is not borne from experience but from information some of my good friends in India have provided me, following questions asked via the #DOC (Twitter diabetes online community). I’d like to thank my friends Gautam, Madhu and Yogesh for their help in getting me the information for this article. IMPORTANT UPDATE: Since posting this article last night my friend Gretchen, who is insulin dependant and travelling in India at the moment, has said that she could not find Humalog anywhere in Puri or Kolkata (Calcutta), even though getting it in those places is not meant to be a problem. Bear in mind that whilst Puri is tiny and only has a population of 200,000, Kolkata is a major city with a population of 5 million. Both are on the west coast so perhaps Humalog is not readily available there? Using the sources listed under ‘Insulin availability’ above as of now – 6th January 2013 – the following prices apply. The rates are very good at the moment, I’ve seen rates 25% lower.